Recommended levels of calcium and vitamin D in the United States are among the highest in the world. Does research justify these levels? Are they even safe? Current studies offer conflicting results but support encouraging dietary intake over supplements. The recommendation for 1,000 mg to 1,200 mg of calcium per day is far from universal. Britain's National Health Service recommends adults get 700 mg of calcium per day, and individuals in Nordic countries are also within the 800 mg to 900 mg range.2 A European Food Safety Authority report in May 2015 recommended 950 mg/day for adults over the age of 25.3 In 2003, the World Health Organization's report on diet, nutrition, and the prevention of chronic disease concluded that, "In countries with a high fracture incidence, a minimum of 400 mg to 500 mg of calcium intake is required to prevent osteoporosis. "4 This is far below the American recommendations. The necessary levels of calcium and vitamin D intake are not the only unsettled issue. In September 2015, the British Medical Journal published a study questioning the effectiveness of America's current calcium recommendations for protecting bone health. This meta-analysis of randomized controlled trials by Bolland and colleagues concluded evidence that calcium prevents fractures is "weak and inconsistent. "5 "Firstly," lead author Bolland says, "in 59 randomized controlled trials we found that increasing calcium intake either from the diet or by taking calcium supplements led to similar small one-off increases in bone density of 1% to 2%. These increases do not build up over time and are too small to produce significant reductions in the chance of having a fracture. Secondly, the level of dietary calcium intake is not associated with the risk of having a fracture in 44 cohort studies. Thirdly, in 26 clinical trials, calcium supplements have only small inconsistent benefits on preventing fractures, with no effect on fractures seen in the highest quality trials." With all of these confounding factors and variations, it may be difficult to reach a consensus. While Bolland and others believe that "there is actually no evidence of an important relationship between calcium intake and bone health in older people, and these dietary recommendations should be revised," advocacy organizations and health policymakers are standing by the IOM recommendations for now. In July 2013, Reid performed a meta-analysis of randomized placebo-controlled trials of calcium supplements and found a 27% to 31% increase in the risk of heart attack and a 12% to 20% increase in the risk of stroke with calcium supplementation, with or without vitamin D.11 That same year the National Institutes of Health-AARP diet and health study suggested that high intake of supplemental calcium is associated with an excess risk of CVD death in men and recommended further research.12 But not all studies agree. The mixed messages on calcium recommendations and concerns about supplement safety are confusing to patients and clinicians alike. "It is very frustrating for clinicians to have to go through this with every osteoporosis patient they see," Dawson-Hughes says. For now, the consensus advice is to continue encouraging calcium and vitamin D at recommended levels but to shift the focus to dietary intake over supplementation whenever possible. "People should strive to meet the calcium levels recommended by the IOM, using food sources to the greatest extent possible," Dawson-Hughes says. "Those who cannot meet requirements using food can take supplements to get there. Getting more than the recommended levels is not a good idea though" since there is the possibility of an increased risk of kidney stones and other potential adverse effects. One area in which the data on the benefits of supplementation is unequivocal is in institutionalized elderly subjects, where calcium and vitamin D supplementation, particularly in the presence of dietary deficiencies, has been shown to reduce osteoporotic fracture risk.15 Even Bolland, who recommends against increasing calcium intake to prevent fractures in general, agrees that the evidence is conclusive in this particular population.5 For the broader population, looking for deficiency or inadequate intake is a good place to start because the positive impact of increasing intake of calcium and vitamin D is clearest in individuals who are deficient. 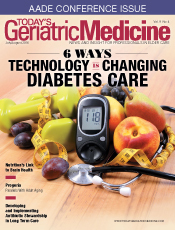 While this issue continues to evolve, clinicians should keep a close analytical eye on emerging research and continue to encourage patients to support their bone health by quitting smoking, being physically active, and including sources of calcium and vitamin D such as dairy, fortified dairy substitutes, dark leafy greens, almonds, and beans as part of a healthful well-balanced diet. 1. Institute of Medicine. 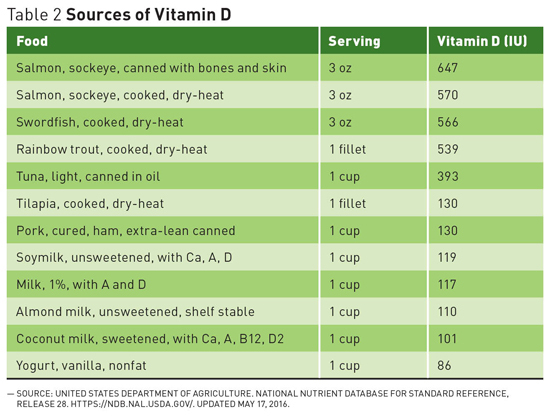 Dietary Reference Intakes for Calcium and Vitamin D. Washington, DC: The National Academies Press; 2011. 2. Michaëlsson K. Calcium supplements do not prevent fractures. BMJ. 2015;351:h4825. 3. European Food Safety Authority Panel on Dietetic Products, Nutrition and Allergies. 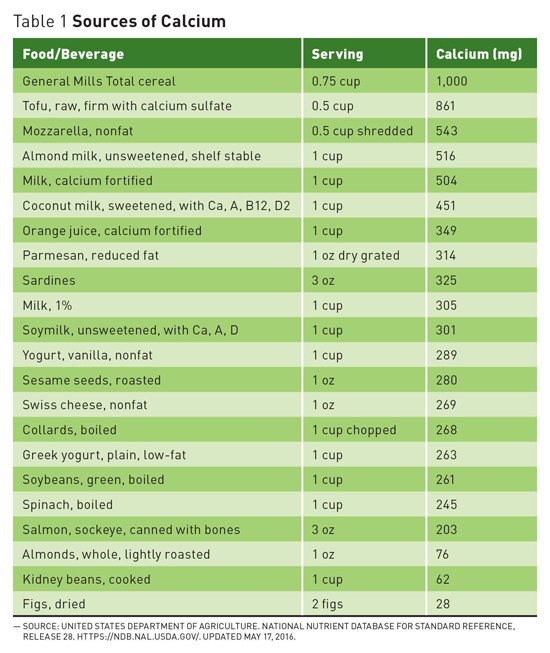 Scientific Opinion on Dietary Reference Values for calcium. EFSA. 2015;13(5):4101. 4. Recommendations for preventing osteoporosis. In: World Health Organization. (Diet, Nutrition and the Prevention of Chronic Diseases). Geneva, Switzerland: World Health Organization; 2003:129-131. WHO Technical Report Series 916. 5. Bolland MJ, Leung W, Tai V, et al. Calcium intake and risk of fracture: systematic review. BMJ. 2015;351:h4580. 6. Weaver CM, Alexander DD, Boushey CJ, et al. Calcium plus vitamin D supplementation and risk of fractures: an updated meta-analysis from the National Osteoporosis Foundation. Osteoporos Int. 2016;27(1):367-376. 7. Lips P, Bouillon R, van Schoor NM, et al. Reducing fracture risk with calcium and vitamin D. Clin Endocrinol (Oxf). 2010;73(3):277-285. 8. Seeman E. Evidence that calcium supplements reduce fracture risk is lacking. Clin J Am Soc Nephrol. 2010;5(Suppl 1):S3-S11. 9. Bolland MJ, Grey A, Reid IR. Should we prescribe calcium or vitamin D supplements to treat or prevent osteoporosis? Climacteric. 2015;18(Suppl 2):22-31. 10. Li K, Kaaks R, Linseisen J, Rohrmann S. Associations of dietary calcium intake and calcium supplementation with myocardial infarction and stroke risk and overall cardiovascular mortality in the Heidelberg cohort of the European Prospective Investigation into Cancer and Nutrition study (EPIC-Heidelberg). Heart. 2012;98(12):920-925. 11. Reid IR. Cardiovascular effects of calcium supplements. Nutrients. 2013;5(7):2522-2529. 12. Xiao Q, Murphy RA, Houston DK, Harris TB, Chow WH, Park Y. Dietary and supplemental calcium intake and cardiovascular disease mortality: the National Institutes of Health-AARP diet and health study. JAMA Intern Med. 2013;173(8):639-646. 13. Kahn B, Nowson CA, Daly RM, et al. Higher dietary calcium intakes are associated with reduced risks of fractures, cardiovascular events, and mortality: a prospective cohort study of older men and women. J Bone Miner Res. 2015;30(10):1758-1766. 14. Latest research on osteoporosis, bone fractures in men, calcium and vitamin D supplements and new treatments for bone disease released at ASBMR 2013 Annual Meeting. American Society for Bone and Mineral Research website. http://www.asbmr.org/About/PressReleases/Detail.aspx?cid=285ee54c-d6c1-4940-930a-4f9e87176a7c. Published October 14, 2013. 15. Boonen S, Bischoff-Ferrari HA, Cooper C, et al. Addressing the musculoskeletal components of fracture risk with calcium and vitamin D: a review of the evidence. Calcif Tissue Int. 2006;78(5):257-270.